A school with a unique educational project, pilot within the Barcelona’s public school network. Les Glories Square, a transforming urban environment full of potential, some of it yet to be decided. From the beginning, there has been a dialogue with the school and the Department of Education. We are working together on a proposal to fit within the existing regulatory framework the specific need of the school community. 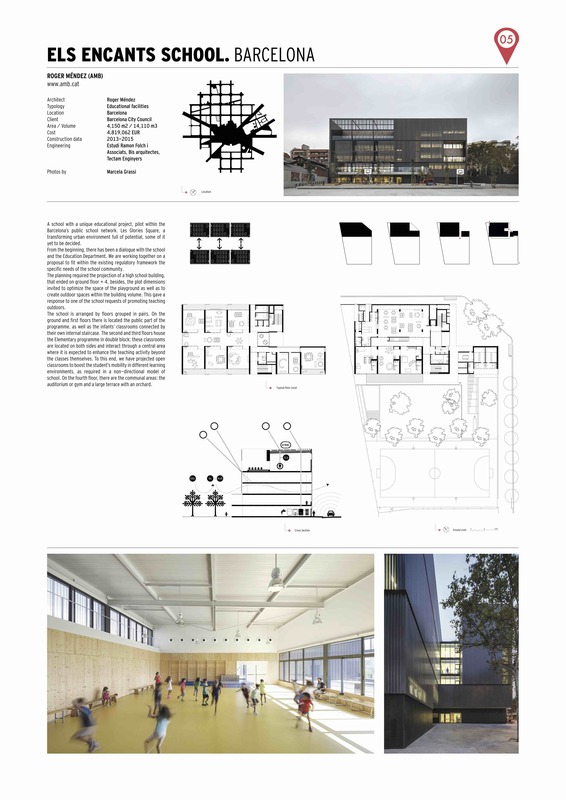 The planning required the projection of a high school building, that ended on ground floor +4, besides, the plot dimensions invited to optimize the space of the playground as well as to create outdoor spaces within the building volume. This gave a response to one of the school’s requests of promoting teaching outdoors. The school is arranged by floors grouped in pairs. On the ground and first floors there is located the public part of the program, as well as the infant’s classrooms connected by their own internal staircase. The second and third floors house the Elementary program in double block; these classrooms are located on both sides and interact through a central area where it is expected to enhance the teaching activity beyond the classes themselves. To this end, we have projected open classrooms to boost the student’s mobility in different learning environments, as required in a non-directional model of school. On the fourth floor, there are the communal areas: the auditorium or gym and a large terrace with an orchard.